When I read this, I felt that lump creep up in my throat. Baklava? It’s one of my most favorite of treats. Sweet and sticky with honey, flaky, with a bunch of lovely nuts in between the layers. But gluten-free? I’ve never seen it – and certainly never tried it. One of the keys to those flaky layers in the phyllo dough is that stretchiness in gluten. If there’s no gluten, how do you recreate the stretchiness? So I googled. I looked for gluten-free phyllo dough. I wasn’t finding much, and not everyone out there in the internet world was successful at making it. This was an elusive thing for sure. But I perservered. I found some instructions on Glutenfreeda.com and opted to try my hand at it. After I started to roll out my layers, I started to feel more confident. I could roll out pretty thin sheets of dough with success. I rolled each layer on parchment, but as time went on, found that it would peel from plastic wrap even easier than parchment, so I changed to using plastic wrap. One daunting task achieved – I could roll thin dough. I then made the filling – this was easy. Just a blitz in the food processor and I was ready for the next step. Then came the assembly. This went well, which further bolstered my confidence. I could peel the dough, layer by layer, brushing with vegan butter in between, layering the nut mixture as well, until I had a completely layered dish. Even cutting the pieces was pretty easy. All that was left was baking and allowing it to sit. And so I did, crossing fingers. Once it came out of the oven, this was when I was concerned. No flakiness. It looked virtually the same coming out as it did going in – only a wee bit more brown. I went ahead and poured the syrup over and allowed it to sit, hoping for the best. So the perfect gluten-free baklava still eludes me. It’s still in my dreams, however. Hopefully someday soon, I’ll muster up the courage to try the phyllo dough again. Thanks to Erica for this challenge – I hope to one day conquer it! Whisk together flours, psyllium husks, and guar gum. Set aside. In the bowl of a stand mixer, whisk together eggs, coconut milk, and water. Attach the dough hook to the mixer. Gradually add in the flour, with the machine on low, until the dough is no longer sticky. (add additional tapioca starch as needed) Cover the dough with plastic wrap and let rest for 2 hours. Remove the dough from the bowl and cut it into 8 equal pieces. Cut 8 pieces of parchment paper at least 10 inches wide. Using generous amounts of tapioca starch, roll each piece of dough onto a piece of parchment paper until it measures at least 10 inches by 6 inches, making sure the thickness is fairly uniform. You want it as thin as possible without breaking. Repeat with each piece of dough. Cover with a piece of plastic wrap to keep from drying out. Preheat oven to 350 degrees. Combine cinnamon, allspice, almonds, walnuts, pistachios, dates, and salt in the bowl of a food processor fitted with the metal blade. Pulse several times until nuts and dates are finely chopped (but not turned into dust). Trim your phyllo sheets to fit your pan by setting the pan on top of each sheet, and using a pizza cutter or knife, cut around the pan. Brush melted ghee/vegan butter inside the pan along the bottom and sides. Carefully peel a piece of phyllo dough (I used a thin, flexible spatula to help me) and place in the bottom of the pan. Brush with “butter” and peel another piece of phyllo dough, placing it over the first. Brush with “butter” again. Place 1/3 of the nut filling evenly over the dough in the pan. Add another 2 layers of phyllo dough, followed by “butter” on top of each. Add another 1/3 of the nut filling. Add another 2 layers of the phyllo dough followed by “butter” on top of each, the final 1/3 of the filling, and finish with the last 2 layers of phyllo dough, followed by “butter” on top of each. Tuck down any edges that are flipping up on the sides of the pan with a spatula so that the top looks neat. 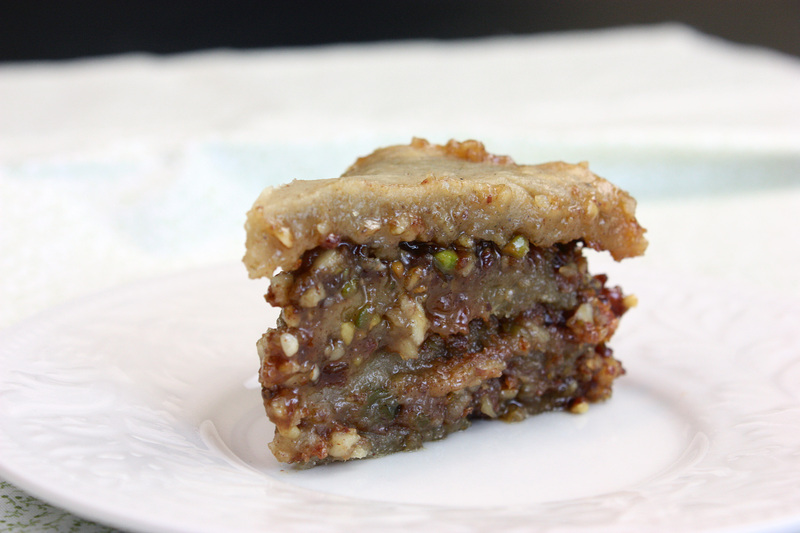 Using a knife, carefully cut the baklava into pieces as desired. Brush one last time with “butter”, making sure you get it covered completely. Bake for 30-40 minutes or until golden brown. Meanwhile, make syrup. Place all ingredients in a small saucepan and bring to a boil. Reduce heat and simmer for 10 minutes. Remove from heat and allow to cool. Remove cinnamon, cloves, and lemon peel. When the baklava is finished baking, cut again all the way through. Pour the syrup evenly over all of the baklava. Allow to cool to room temperature. When cool, cover and allow to sit overnight to allow syrup to absorb. The April 2011 Daring Bakers’ challenge was hosted by Evelyne of the blog Cheap Ethnic Eatz. Evelyne chose to challenge everyone to make a maple mousse in an edible container. Prizes are being awarded to the most creative edible container and filling, so vote on your favorite from April 27th to May 27th at http://thedaringkitchen.com! After some time to think, I remembered that a year or two ago, bacon chocolate chip cookies were all the rage in the food blog world. Having never made them myself, I decided I would play with a chocolate chip cookie recipe, only instead making them in a cup form. I set off making dough and pressing the dough into muffin cups. The rest was easy. Scoop in the maple mousse, top with bacon bits, and refrigerate. Voila – an edible container with a delicious mousse! The verdict? I think if I try this again, I’ll modify the cookie/cup recipe somewhat. It was a bit dry and crumbly. The mousse, however, was amazing. I could sit down and eat tons of that by itself. As for the bacon-in-a-dessert thing? It’s not bad (it adds a lovely sweet-savory touch, but didn’t taste much like bacon), but it’s not my favorite combination. I could take it or leave it. I think I’d much prefer just to enjoy the mousse unadorned (or maybe with some dairy-free whipped cream). This was definitely a fun challenge! A big thanks to Evelyne. In a large bowl, whisk together flours, chia seed meal, baking soda, and salt. In the bowl of a stand mixer, add buttery sticks/oil, sugar, and coconut nectar and beat for about 3 minutes or until blended. Add egg and vanilla and mix on medium until incorporated. Stir in half of the bacon and all of the chocolate chips. Refrigerate for an hour or until firm. Preheat oven to 350 degrees. Grease a muffin tin and divide into 8-9 of the muffin cups, pressing up against the sides. Bake for 12-14 minutes or until beginning to brown on the edges and set in the center. Allow to cool for 10 minutes, then carefully remove from tin and place on cooling rack to cool completely. With a melon baller or similarly sized spoon, scoop out the center of each chocolate chip cup. Fill with chilled maple mousse and garnish with remaining bacon. Bring maple syrup to a boil and remove from heat. In a bowl, whisk egg yolks and pour a little bit of maple syrup in while whisking (this is to temper your egg yolks so they won’t curdle). Add eggs to maple syrup and whisk until well mixed. Measure ¼ cup of the coconut cream and place in a bowl. Sprinkle gelatin over and allow to sit for 5 minutes. Place in microwave for 15 seconds and then stir, and microwave for 10 seconds more if needed to dissolve gelatin completely. Whisk gelatin mixture into the maple syrup and set aside. Whisk occasionally, leaving mixture out for about an hour, until the mixture has the consistency of an unbeaten raw egg white. Whip the remaining coconut cream in a large bowl. Stir ¼ of the whipped cream into the maple syrup mixture. Fold in the remaining cream and refrigerate for at least an hour. 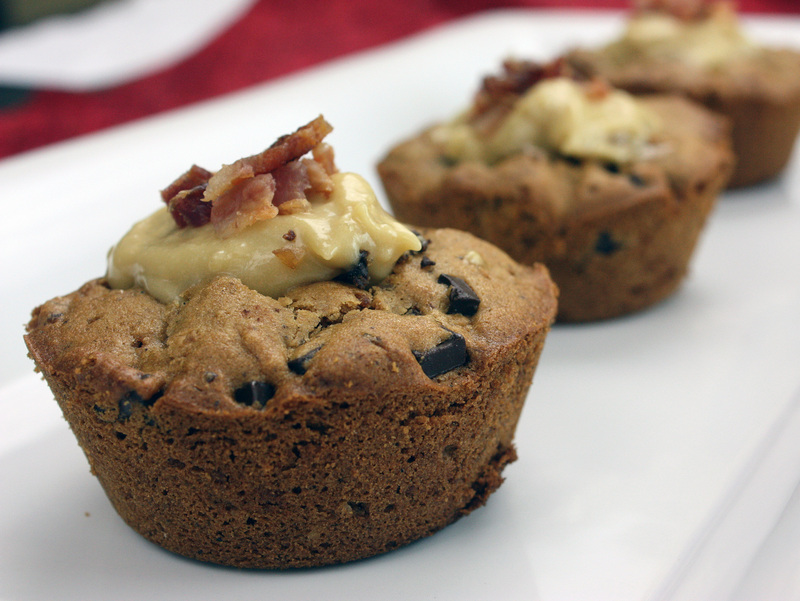 Remove from fridge, whisk, and scoop into bacon chocolate chip cups. The February 2011 Daring Bakers’ challenge was hosted by Mallory from A Sofa in the Kitchen. 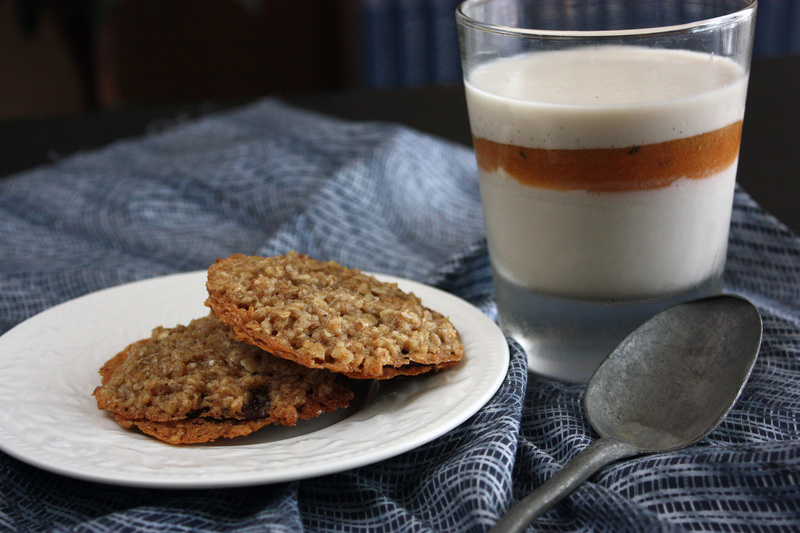 She chose to challenge everyone to make Panna Cotta from a Giada De Laurentiis recipe and Nestle Florentine Cookies. Panna Cotta. That simple, yet oh-so-satisfying cream-based dessert. It stands the test of time. It’s a go-to recipe for anyone who wants to delight their dinner guests, and it’s relatively uncomplicated…until you go and throw that whole dairy-free thing in there. But alas, this is why I joined Daring Bakers and Daring Cooks – to not only take on the challenge of making something new, but also to make it gluten and dairy-free. It hasn’t always been a complete success, but sometimes, it’s that whole “thrill of the chase” thing that keeps me coming back for more. And honestly, the panna cotta was not any more difficult to make non-dairy. This month, I opted to take a risk and share the (hopefully) successful fruits of my challenge with my sister and her husband. They arrived on a Saturday afternoon, twin girls in tow, ready for an evening filled with grilled pork chops topped with sauteed apples, onions, and melty colby-jack cheese (made by my brother-in-law, with Daiya on mine instead of cheese – sweet-and-savory deliciousness! ), a simple spinach salad, mashed sweet potatoes, and this roasted cauliflower dish. Glasses of inexpensive zinfandel were filled, and filled again. Warm, comfortable conversation was made in between baby feedings, rounds of Mario Bros. on the Wii with Brittany (who decided to spend the weekend with us), the debut of a new little video camera, and an occasional attempt at distracting a slightly grumpy, teething baby. And dessert. We sweetened the end of the meal with creamy, rich, dairy-free panna cotta with a peach-thyme gelee, and an overabundance of gluten-free, dairy-free florentine cookies. The panna cotta was made with coconut milk and almond milk instead of cream and milk. The gelee was inspired partly by the lonely bag of frozen peaches leftover from last summer, and this jam recipe. It was a lovely blend of rich and sweet, but not overly so – the fact that I kept it refined sugar-free definitely helped to keep the sweetness at a more natural level. The florentine cookies, on the other hand, were definitely sweet. In spite of my use of dark chocolate, they still were still plenty sweet – although not cloying. While I’d never enjoyed this cookie before – a lovely oat-y sandwich, filled with chocolate – I knew it would be a favorite. It was definitely well-received by my sister and brother-in-law. As I know my limitations on self-control around good cookies, and they were both so excited about them, I sent them home with the rest. These two recipes were lovely – and I was excited to finally get around to making panna cotta. The cookie stole the show, however. A big thanks to Mallory for this month’s challenge! Pour the almond milk into a bowl and sprinkle gelatin over evenly. Let stand for 5 minutes to soften the gelatin. Pour the almond milk into a saucepan and place over medium heat on the stove. Heat until hot, but not boiling. Whisk a few times during this process. Next, add the coconut milk, honey, and pinch of salt. With a small knife, carefully cut the vanilla bean lengthwise and scrape out the seeds into the saucepan. Making sure the mixture doesn’t boil, continue to heat and stir occasionally until the honey has dissolved, 5-7 minutes. Remove from heat and allow to cool slightly. Then pour into glasses or ramekins. 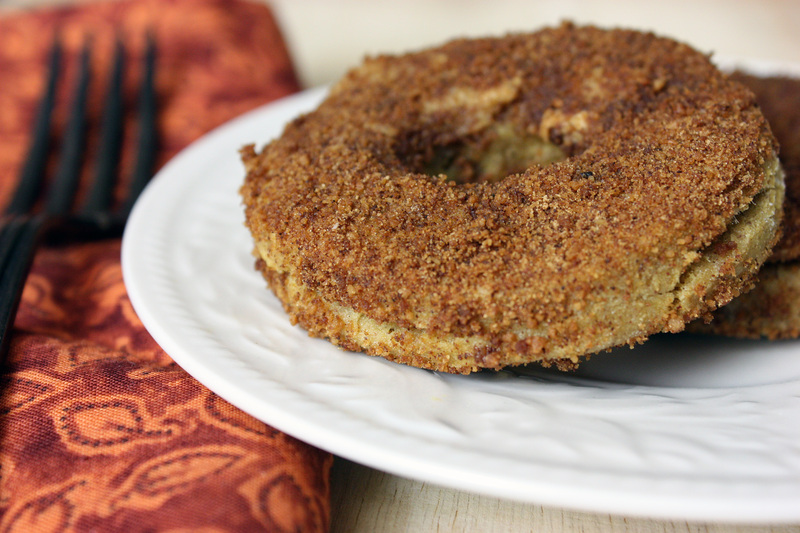 (I used 5, but you could easily make this a 6-serving recipe.) Refrigerate at least 6 hours or overnight. Sprinkle gelatin over water. Place fruit and honey in a small saucepan and simmer until honey has dissolved. Mix the gelatin mixture into the fruit and stir until gelatin has dissolved. Remove from heat and allow to cool slightly. Puree in a blender. Once panna cotta is sufficiently gelled, carefully spoon gelee over top. Refrigerate 6 hours or overnight. Preheat oven to 375 degrees. Prepare your baking sheets with parchment paper or a Silpat. Melt vegan buttery sticks in a small saucepan and remove from heat. Add oats, sugar, flours, chia/flax slurry, agave nectar, almond milk, vanilla, and salt. Mix well. Drop by the tablespoonful, three inches apart, on the baking sheet. Flatten slightly with the back of your spoon. Bake for 6-8 minutes, or until cookies are golden brown. Cool completely on baking sheets. Melt the chocolate in a double boiler (I use a stainless steel bowl large enough to sit on top of a small saucepan with an inch or so of simmering water) until smooth. Place the cookies upside down and spoon a bit of chocolate into the middle of each, and place another cookie on top to make a sandwich. No, what you’re looking at above is not an entremet. Not even close. But sometimes, there is a silver lining to that dark cloud that seems to rain on your kitchen creations. That silver lining in this case was a simple, light, and delicious pomegranate gelee. But we’ll get to that in a moment. Let’s first start at the beginning. And yes, my hopes were high. I was to make a thin, pretty, decorated cake to wrap around a filling of my choice. Many entremets are filled with bavarian cream, or cheesecake, or any number of other lovely concoctions. I pondered for a while on how to accomplish this gluten and dairy-free, but I devised a plan. I would simply swap out gluten-free flours for the regular flour, and I’d fill mine with my vegan cheesecake recipe. My plan was to make a middle layer of more of the cake and some “cinnamon roll” filling – which was basically a paste of dates, cinnamon, and pecans. 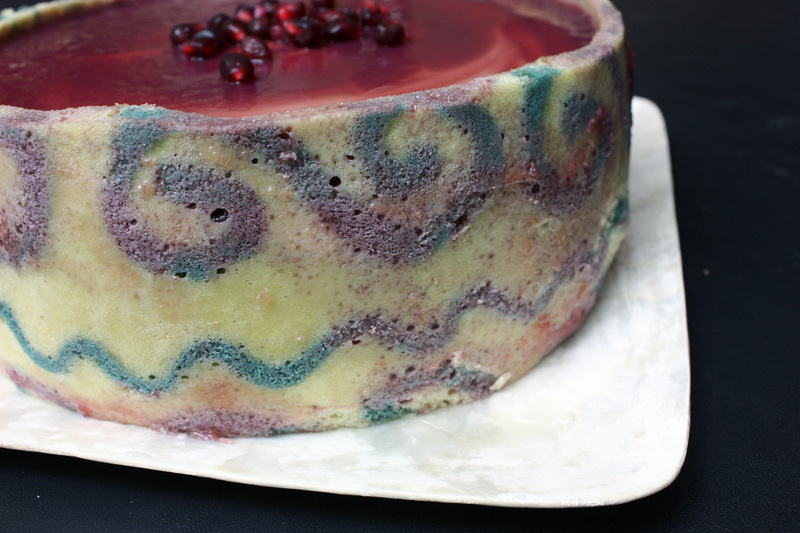 Finally, I’d top it with a pomegranate gelee – so the top would look sparkly and like a pretty red glass. In my head, this sounded spectactular. Only I should have stopped when I was coloring my jaconde (the design filling). I was low on natural food dye. All I really had was blue. So I went with it. 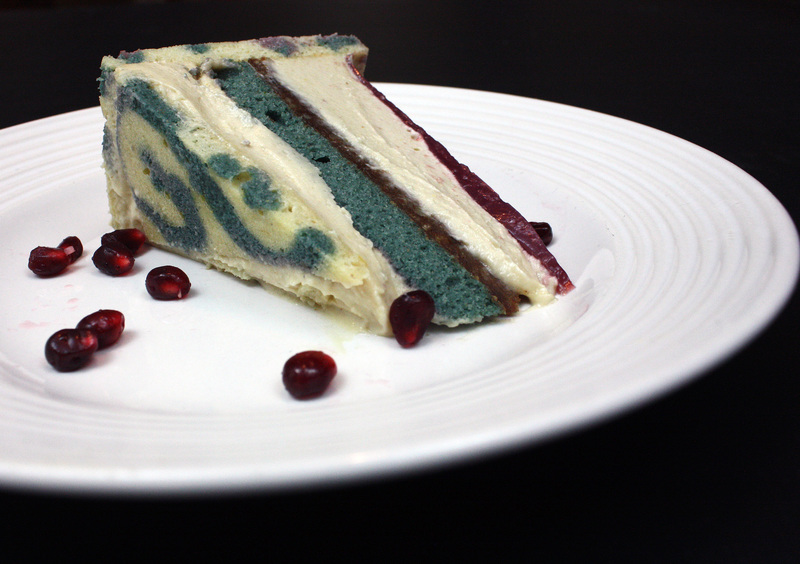 (Only blue really isn’t that appetizing for a cake. Or very many foods, actually – except for blueberries.) The cake actually turned out beautifully, except for the blue part. The texture was spongy, and it was pliable. It was relatively easy to wrap around my 9″ cheesecake mold. Despite the less-than-stellar color, I was excited. I filled it with the cheesecake filling, and stuck it in the freezer to firm up. A while later, I made the pomegranate gelee. This is where things turned for the worse. I thought that somehow, when I poured the liquid juice-and-gelatin mixture over the cake, that it would stay where it was supposed to. It didn’t. 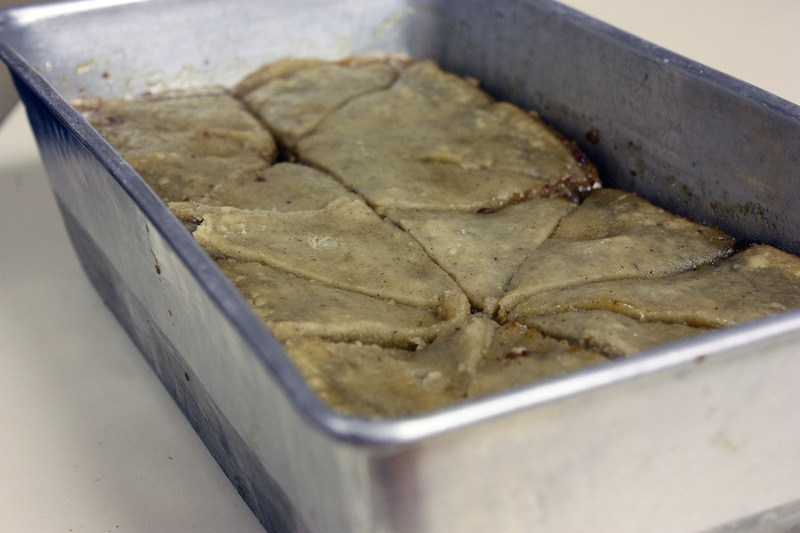 Instead it leaked all down the sides of the cake, making pink splotches and causing the cake to look, well…ugly. It actually tasted alright, but I couldn’t get over how it looked. The combination of colors was downright unappetizing. 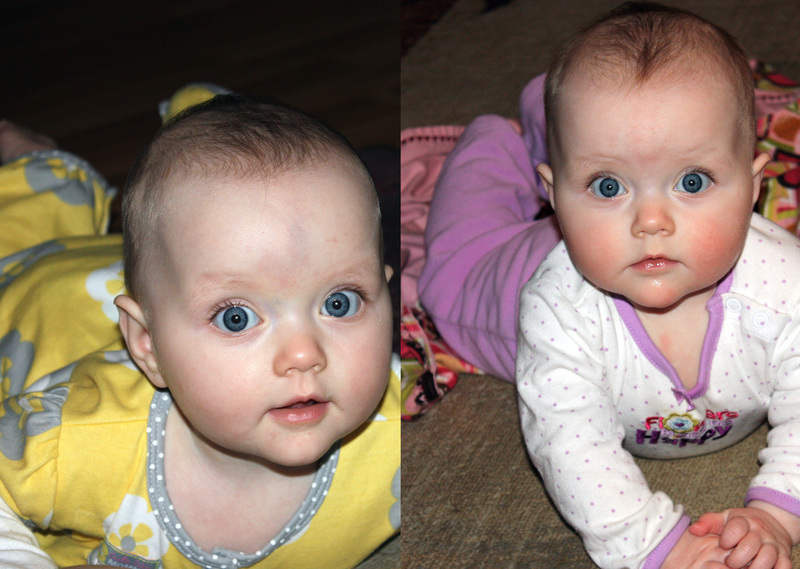 I begrudgingly took my photos, tasted a bit, but it ultimately ended up in the garbage. I was disappointed. Until I realized that I still had pomegranate gelee left over. You see, I made way more than I needed for the entremet, so I opted to pour the rest into individual serving bowls and sprinkle some pomegranate arils into each of them. I placed them in the refrigerator to set. I took one out, grabbed a spoon and dug in – and somehow, the sting of failure lessened. My mistake caused an unexpected success – almost a yin and yang in the kitchen. The pomegranate gelee was sweet, tart, and fresh. It was light. I loved it. But wait, you say. You took pictures? Where are they? A slice of the entremet - I think any color but blue would have improved it! There you go. I would love to try this challenge again soon, knowing what I know now. I think it could be a lovely, impressive treat for company or a special occasion. I will go ahead and share the revised version of the biscuit jaconde (cake) recipe with you – but trust that you shouldn’t dye it blue, and learn from me – don’t pour liquid on top of it and expect it to stay there! As for the pomegranate gelee, this was probably the easiest dessert recipe I’ve ever posted. It’s almost not a recipe. But if you have guests coming over, but want dessert to be easy and something that you literally can just pull out of the refrigerator and serve, this is it. A big thanks to Astheroshe for this challenge. It was fun, even if mine didn’t turn out as planned. I’m definitely going to try again soon! Pour powdered gelatin into a small bowl and pour about 3-4 tablespoons of the juice over. Allow to sit. Meanwhile, heat the rest of the juice over medium heat until nearly to a boil. Remove from heat and whisk in gelatin mixture until smooth. Allow to cool for a few minutes and pour into desired serving bowls (I used bowls, but wine or champagne glasses could be extravagant too). Place in refrigerator and chill for 3-4 hours. 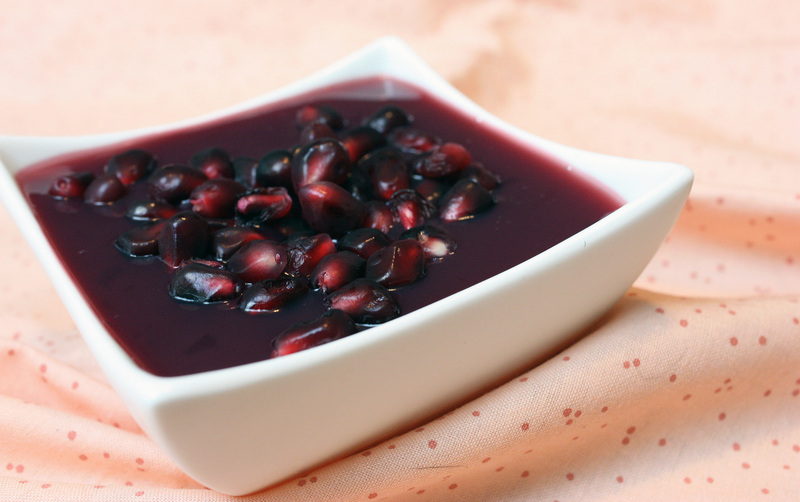 About halfway through the chill time, sprinkle some pomegranate arils over each. When the gelee is set, they are ready to serve. In a clean mixing bowl whip the egg whites and white granulated sugar to firm, glossy peeks. Reserve in a separate clean bowl to use later. Fold in one third reserved whipped egg whites to almond mixture to lighten the batter. Fold in remaining whipped egg whites. Do not over mix. Reserve batter to be used later. COCOA Décor Paste Variation: Reduce cake flour to 6 oz / 170g. Add 2 oz/ 60 g cocoa powder. Sift the flour and cocoa powder together before adding to creamed mixture. Gradually add egg whites. Beat continuously. Tint batter with coloring to desired color, if not making cocoa variation. Spread a thin even layer of décor paste approximately 1/4 inch (5 millimeter) thick onto silicone baking mat with a spatula, or flat knife. Place mat on an upside down baking sheet. The upside down sheet makes spreading easier with no lip from the pan. Slide the baking sheet with paste into the freezer. Freeze hard. Approx 15 minutes. Remove from freezer. Quickly pour the Joconde batter over the design. Spread evenly to completely cover the pattern of the Décor paste. Bake at 475ºF /250ºC until the joconde bounces back when slightly pressed, approx. 15 minutes. You can bake it as is on the upside down pan. Yes, it is a very quick bake, so watch carefully. Cool. Do not leave too long, or you will have difficulty removing it from mat. – Start with a large piece of parchment paper laid on a very flat baking sheet. Then a large piece of cling wrap over the parchment paper. Place a spring form pan ring, with the base removed, over the cling wrap and pull the cling wrap tightly up on the outside of the mold. Line the inside of the ring with a curled piece of parchment paper overlapping top edge by ½ inch. CUT the parchment paper to the TOP OF THE MOLD. It will be easier to smooth the top of the cake. – A biscuit cutter/ cookie cutter- using cling wrap pulled tightly as the base and the cling covering the outside of the mold, placed on a parchment lined very flat baking sheet. Line the inside with a curled piece of parchment paper overlapping. – Cut PVC pipe from your local hardware store. Very cheap! These can be cut into any height you wish to make a mold. 2 to 3 inches is good. My store will cut them for me, ask an employee at your store. You can get several for matching individual desserts. Cling wrap and parchment line, as outlined above. – Glass Trifle bowl. You will not have a free standing dessert, but you will have a nice pattern to see your joconde for this layered dessert. 1. Trim the cake of any dark crispy edges. You should have a nice rectangle shape. 2. Decide how thick you want your “Joconde wrapper”. Traditionally, it is ½ the height of your mold. This is done so more layers of the plated dessert can be shown. However, you can make it the full height. 4. Make sure your strips are cut cleanly and ends are cut perfectly straight. Press the cake strips inside of the mold, decorative side facing out. Once wrapped inside the mold, overlap your ends slightly. You want your Joconde to fit very tightly pressed up to the sides of the mold. Then gently push and press the ends to meet together to make a seamless cake. The cake is very flexible so you can push it into place. You can use more than one piece to “wrap “your mold, if one cut piece is not long enough. 5. The mold is done, and ready to fill with anything from cheesecake to bavarian cream to fruit or even more cake layers. The possibilities are endless. The 2010 December Daring Bakers’ challenge was hosted by Penny of Sweet Sadie’s Baking. She chose to challenge Daring Bakers’ to make Stollen. She adapted a friend’s family recipe and combined it with information from friends, techniques from Peter Reinhart’s book…and Martha Stewart’s demonstration. I have heard of Stollen, but have never made it. I’m not a fruitcake person, really, but I do love dried fruit and nuts, and this was more of a bread than a cake. I was excited to give it a try, but knew I only had 1 shot at getting it right. Instead of trying to guess which gluten-free flours would make a perfect bready texture (and I’m out of several of them, and have to wait for my online order to arrive), I opted instead for Pamela’s Bread Mix. I’ve used it multiple times for pizza crust and hamburger buns, and it bakes up fluffy and light. As for the dairy-free substitutions, that was a breeze – I used So Delicious coconut beverage for the milk, and palm shortening for the butter. I opted to not use red glace cherries, instead substituting dried cherries and bumping up the amount of dried fruits in the bread. The verdict? I was worried it wasn’t rising at first. I made the dough and let it rest in the refrigerator for 2 days, and when I let it warm, rolled it out, and rested it, it really didn’t look as though it rose. I know gluten-free dough has a tendency to have difficulty rising (that lack of gluten! ), but I had concerns it was going to bake into a doughy lump. But once it was in the oven, it rose, browned, and looked delicious and crusty. And when we ate it – heaven. Yum. Not too sweet, crusty on the outside, and a soft interior studded with sweet cherries. I would love to make this again. Next time, I’d love to soak my dried fruit for longer (I only soaked for about an hour), to really bump the flavors, (and probably use rum instead of bourbon) but overall, a lovely Christmas treat. In a small bowl, soak the raisins, dried cranberries, and dried cherries in the bourbon and orange juice. 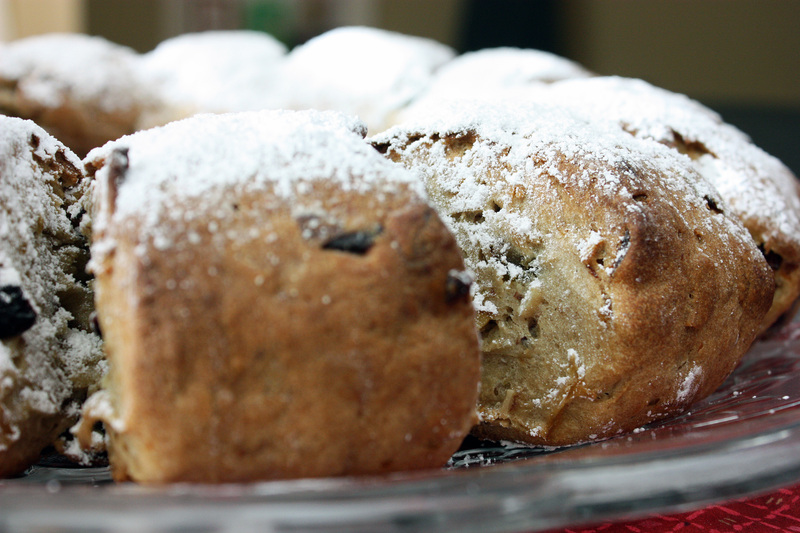 Set aside while you work on the rest of the stollen. Add the yeast to the warm water and stir to dissolve. Allow to sit for a few minutes to “proof”. In a small saucepan, combine the non-dairy milk and the shortening and melt the shortening over medium heat. Remove from heat and let stand until lukewarm (about 110 degrees F). Lightly beat eggs with extracts in a small bowl. In a large mixing bowl, stir together the flour, xanthan gum (if using), sugar, salt, cinnamon, and zests. Then stir in the yeast mixture, eggs, and the lukewarm milk mixture. Mix until dough comes together. Cover with a towel and allow to rest for 10 minutes. Add in the candied peel, the soaked dried fruit, and the almonds and mix with your hands or with a mixer (with a dough hook) on low until well-incorporated. Sprinkle some additional gluten-free flour onto a clean counter, and turn dough onto flour. With floured hands, knead dough for approximately 8 minutes. Dough should be slightly sticky, but not excessively so. The raisins and dried fruit might fall out of the dough a bit as you knead – this is good. Just keep pressing them back in. Gather the dough and make a ball. Lightly oil a large, clean bowl, and place the dough ball in it, rolling it around to coat. Cover with plastic wrap and refrigerate overnight. Remove from refrigerator and allow to come to room temperature on the counter for about 2 hours. Place a large sheet of parchment paper on the counter and turn dough onto it, and place another large piece of parchment on top. Roll dough out into a rectangle about 16 X 24 inches and about 1/4 inch thick. Remove the top sheet of parchment, and starting with the long side, roll dough up tightly into a cylinder. Transfer the cylinder roll to a sheet pan. Form the roll into the shape of a wreath, using a bowl in the center as a guide, if needed. Pinch the ends together. Using kitchen shears, make cuts along the outside of the circle, about 2 inches apart, and about 2/3 of the way through the dough. Roll these pieces towards the outside of the wreath so that the cuts separate somewhat. Cover wreath loosely with plastic wrap and allow to rise for 2 hours. Preheat oven to 350 degrees. Bake for 20 minutes and rotate 180 degrees. Bake for another 30 minutes or until dough reaches 190 degrees F in the center and wreath is deeply browned. Remove from oven and brush with melted non-dairy butter. Using a sifter or a fine-mesh strainer, sprinkle powdered sugar over the wreath in an even layer. Allow to soak in for a minute, and sprinkle another layer of sugar. Allow to cool for 1 hour before serving, or store in a plastic bag once completely cool. The 2010 November Daring Bakers’ challenge was hosted by Simona of briciole. She chose to challenge Daring Bakers’ to make pasta frolla for a crostata. She used her own experience as a source, as well as information from Pellegrino Artusi’s Science in the Kitchen and the Art of Eating Well. I was unaware whether I had ever actually eaten a crostata before. Simona explained that a crostata was an Italian tart made with pasta frolla, a shortbread crust made with flour, sugar, butter, and eggs. It could be filled with preserves, cream, fresh fruit, ricotta, or a variety of other ingredients. As I am a lover of all things pie and tart-related, this sounded like a delicious challenge, especially since I wanted to make one that was still delicious, without wheat flour, sugar, or butter! But then reality set in – when would I make such a dessert? For some of you that might follow me on FaceBook or know me, I recently switched jobs, and so I’ve been filling my days learning a new commute (this commute is longer than my old one), a new way of doing things, and trying to catch up on rest whenever I can. Oh, and that little thing called Thanksgiving was a big event as well – it always is. Not that I’m complaining. I love my new job, and it’s a great opportunity for me. And I very much love Thanksgiving. It’s one of my favorite holidays. Nevertheless, this has left little time for kitchen play lately, so I opted to have my crostata do double-duty, and I would serve it alongside the traditional pies for Thanksgiving dinner. Little did I know that it would ultimately steal the show. I can see other fruit crostatas in our near future. I still have blueberries frozen from the summer, and I have more peaches (not preserves) frozen as well. 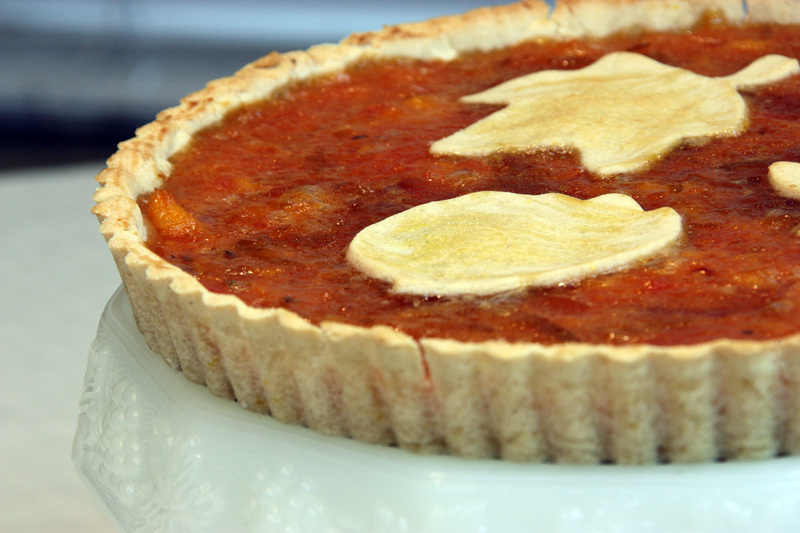 And next summer, these crostatas will appear in full force, I do believe! This crostata was well-praised by my family for Thanksgiving, so I imagine it would be welcomed anytime. Whisk together rice flour, sorghum flour, potato starch, sweet white rice flour, and salt. Remove the shortening from the freezer and dice into small pieces. Place it evenly around the flour, and with a pastry blender, a fork, or your hands, mix until the flour has a mealy texture and the largest pieces of shortening are the size of small peas. Lightly beat the egg in a small bowl. Add the vinegar and agave to the egg and beat well. Pour egg mix into the flour mix and stir until just incorporated. Next, drizzle some of the water over the flour mixture and stir in, just until the dough starts to come together. Add more water as you need, but don’t make the dough too wet. It should look “shaggy”. Push the dough together with your hands and place on a large piece of parchment paper. Shape the dough into a ball, and flatten into a disc with your hands. Wrap the parchment paper around the dough and place in a zip-top bag and refrigerate for 45 minutes to 1 hour, or up to overnight. If it’s been several hours since your dough was placed in the refrigerator, allow it to sit out on the counter for 15-20 minutes before working it. Otherwise, place between 2 sheets of parchment paper and roll out in a large circle about 1/8 inch thick. If the paper gets wrinkles in it, pull it up and place it back down again and keep rolling. If it cracks, wet your finger and repair the crack. A trick to put your dough into the pie pan or tart pan – peel the top piece of parchment paper off of the dough, and turn the pan upside-down and place it over the pie dough. Slide your hand underneath the dough and the parchment paper, and place your other hand on top of the pie pan, and quickly flip the pan, dough, and parchment paper over all in one motion. Then, press the dough in a bit into the pan, and slowly and carefully remove the parchment paper. If the dough tears, repair it with your fingers. Once the paper is removed, you can finish pressing the dough into your pan as needed.